DIY 2 x 1 Exhaust system. That's a good idea. It would have to be further broke down into types of rides (like the current forum is). +1 on the pipes! I did it and it works great! 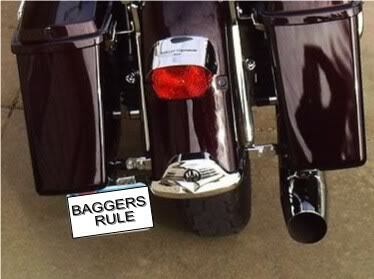 You can use your left muffler bracket for your plate as well! Another DIY is cut off your grab rail and replace it with caps or spikes like I did. 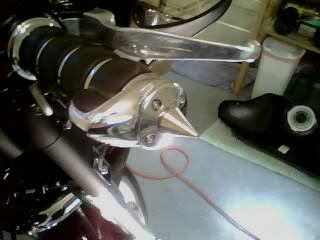 Drill and tap grip ends and add spikes adds a custom look.That's just some of what I have done! I am all about saving money and a personal touch! Here are some pics! I had a smoked lay down lens cover that the bulb melted a hole into. I was just going to throw the lens away, and get a new one. But, instead, I took one of the many die I have laying around the house (I am a craps dealer at a casino), and added that to my lens cover. great idea! i bought a garage door opener remote-split the case and wired a momentary switch to it. drilled a hole in the bottom of my windshield bag for the switch, put the remote in the bag. works great for about 20 bucks. Another little, and very inexpensive, thing I did was when I added the passing lamps to my rk custom. I wanted the extra light, at night, and I like the look. What I did not care for was the look of the black wire coming off the light bar, to behind the nachelle, and into the head light housing. 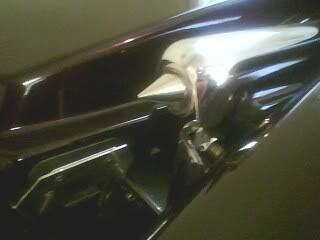 What I did was to go to Autozone and buy this plastic, chrome looking, wire conduit. I wrapped it around the wires, and into the housing. I think it really makes the light bar look finished, and was cheap to do. Even though it is only plastic, it has held up really well. In fact, it looks as good as the day I did it. How did you wire the switch to the remote? I have a Craftsman garage door opener, and was thinking of a way to connect a romote to my bike. What kind of switch did you use, and where did you buy it? split the case on the remote-under the button is a circuit board with two contact points where the button hits when ya press it. solder a wire to each, notch the edge of the case to accomidate the wires and close case. wire a momentary switch to the end of the two wires and mount where you want. i used my windshield bag (left side) but have also drilled a hole in a sidecover on my last bike and had it mounted in there.got everything from home depot. Thanks. I was thinking of somehow wiring it to the left acc switch on the stering column. Is that possible? Also, I had not thought about putting it under the left side cover. That is agood idea.